The basic formula for a successful sports film is to not over burden the audience with facts and to pitch a David versus Goliath scenario. We as Americans love to root for the underdog, and no sports film in history has stayed the course more rigidly and unwaveringly as the film Hoosiers did in 1986. The disgraced coach who is given one last chance for redemption at a small high school; the small town team that fights its way up the ladder for the chance of a state championship title; and finally the one time local hero who is given the chance to prove his basketball savvy, all the while fighting with his addiction to alcohol. To use the term clichéd is to put it mildly when referencing this film, as these re-treaded subplots are piled on top of each other like a stack of pancakes, which has been doused with an overabundant amount of syrupy sentimentalism. 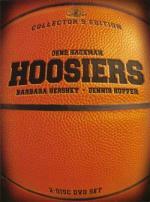 That being said, Hoosiers is one the best sports films of all time, and manages to push all the right buttons. We want to see the team overcome its hardships and succeed so that we can still believe that it is possible for us to mount any challenge that crosses our path. Gene Hackman stars as Coach Norman Dale, a one-time college basketball coach, who we find out later in the film, has been banished from the college ranks for punching a student. He is given the job as head coach at Hickory high school in Indiana by his friend Cletus (Sheb Wooley), who also happens to be the principal of the school. Right from the start he causes friction in the town when he fires his assistant George (Chelcie Ross) and closes his practice to the townsfolk. The team is not happy with him either after partaking in one of his practices, which they deem as unorthodox compared to what they been doing for years. Heaped on top of this is the loss of the one decent player on the team Jimmy Chitwood (Maris Valainis) who has been swayed by another teacher Myra Fleener (Barbara Hershey), to forego sports and to pursue his academics. With his outlook for success appearing rather gloomy at best, Coach Dale plods on through the many obstacles that lay before him with the confidence of his convictions to guide him, until he slowly begins to win over his team and the town. As I stated earlier, this film is brimming with clichéd themes and subplots and if you’re looking for some startling revelation at the end, then you’re probably going to be disappointed. Since the success of Rocky in 1976, Hollywood has been rehashing this tried and true method of sports film screenwriting, and almost every film that has been released using this formula, has been fondly accepted by the viewing public. Hoosiers is a safe film and won’t cause any discourse in your thought processes, and in the end you be left with an all around good feeling that hope, faith and teamwork can overcome any obstacle presented. Never seen this, but I quite like sports movies to be cliched, otherwise they seem pointless! Actually, and I know it shouldn't really compare, but Dodgeball had an alternative ending where Ben Stiller comes out on top, winning the last game. They said they were trying it that way to be different, but it was awful! Unexpected, yes, but it would have such a downer. You should be flogged for even mentioning a Ben Stiller film. Hey, at least it wasn't Zoolander!